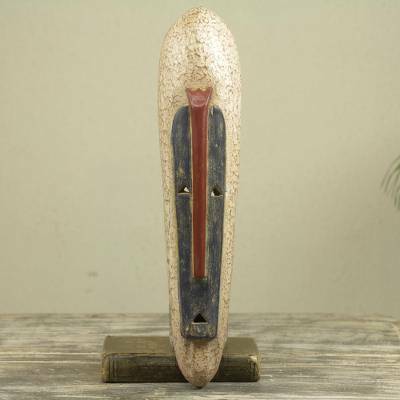 Original African Long Mask for Wall in Hand Carved Wood, "Xoese"
This wall mask exudes a powerful presence with its long blue face and textured cream contours. Featuring a long reddish-brown nose, the sese wood mask is carved and painted by hand. Rita Addo Zakour calls her original design Xoese, meaning "Believe" in the Ewe dialect of Ghana. "It's all about believing in something," comments the Ghanaian artisan.